Arizona is our home state — and one of our favorites for RV travel and camping adventures. There is a lot of variety in this state, from baking hot deserts to chilly high elevation forests to canyons, cliffs and world famous views. 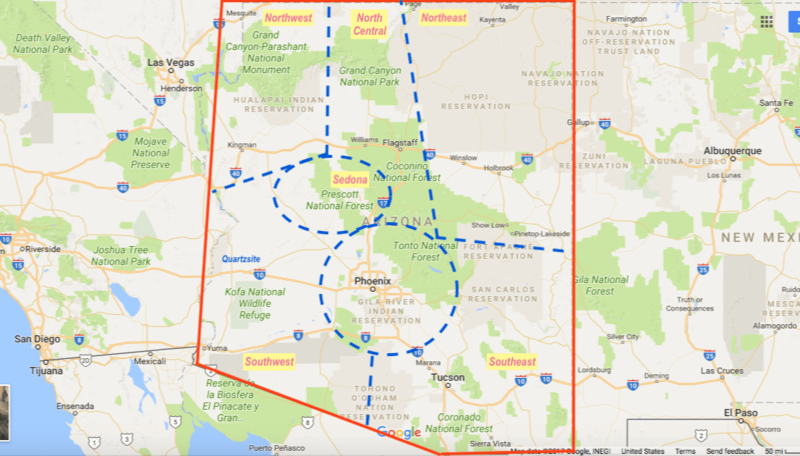 It is possible to stay in Arizona year round and enjoy a moderate climate the whole time, as long as you choose the altitude to match the season (higher altitudes are always colder). The links on this page are divided geographically along these lines. Click the image to see an interactive Google Map of Arizona. Lake Havasu is a great place to visit between fall and spring, with mild temps and lots of action on the Colorado River. We enjoyed staying at an RV resort there as well as watching a balloon festival and seeing a crazy VW Microbus show there in January. Havasu Springs Resort, AZ – Lucky Break! November 3, 2009Passing through Havasu Springs, a guy passing out brochures for free nights at a resort got us to stay – what luck! VW Microbus Mania in Lake Havasu Arizona! February 1, 2015The Buses by the Bridge festival in Lake Havasu, Arizona, was filled with lots of unique VW Microbuses that had been lovingly restored. The Grand Canyon is some 8,000′ or so deep, making temps at the bottom of the canyon similar to the hottest desert regions of the state while the temps at the rim are among the coldest. This high altitude region extends for many miles from the Grand Canyon and is filled with ponderosa pine forests that enjoy four seasons. The North Rim of the Grand Canyon is so snowy in winter that it’s closed between October and May. But a visit in mid-summer can’t be beat! North of the Grand Canyon, on the Utah border, altitudes drop and red rocks and exotic canyons begin to dominate. Grand Canyon’s North Rim – Its Better Half! July 31, 2008The Grand Canyon’s North Rim is less visited than the South Rim, and we found a heavenly campsite in the Kaibab Nat’l Forest. Parowan UT, Las Vegas NV, Williams & Sycamore Canyon AZ – Wow! August 28, 2011We enjoyed the Iron County Fair in Parowan UT as well as the vast views of Sycamore Canyon and nostalgia of Route 66 in Williams, AZ. What is happening to our Public Lands? October 2, 2014Fury over proposed permits for photographers on public land has gone viral, but changes at Grand Canyon are far worse. Wupatki Nat’l Monument – Ancient Indian Ruins & Great Camping in AZ! August 25, 2011Wupatki National Monument in AZ has 1,000 year old Indian Ruins, and next door Bonito Campground is our all-time favorite! Some 15-20% of Arizona is set aside for the Navajo Nation in the northeast corner. The reservation is so big it contains the Hopi Reservation within its borders! This is high elevation cold country, best visited in spring and fall. There are also fabulous rock canyons in the northernmost part of Arizona that borders Utah. A Glimpse of the Navajo (or “Diné” as they call themselves) December 16, 2014Here is an evocative and moving video about the Navajo Indians created by pro photographer Dawn Kish. Canyon de Chelly, AZ – A Canyon of Indian Cliff Dwellings June 27, 2012Canyon de Chelly has evocative Indian cliff dwelling in a gorgeous canyon close to the Navajo Code Talker memorial at Window Rock. Sedona is a stunningly beautiful town loaded with towering red rock formations that fill every view as you drive around. This is a fabulous spring and fall destination, peaking in March-May and October-December (the dates on our blog posts reflect the date the post was written, usually a few weeks after our visit!). Greater Phoenix is surrounded by exquisite Sonoran Desert scenery loaded with saguaro cactus, craggy rocks, washes and beautiful flowers and desert creatures. It is also home to several rivers and lakes which are filled with waterbirds and watersports. “RaVeS” Cafe for RVers in Mesa AZ December 1, 2014The new RaVeS Cafe in Mesa AZ caters to RVs & RVers with fun RV art on the walls and shelves and yummy food too! Arizona’s Stunning Apache Trail Scenic Drive February 9, 2015The Apache Trail is one of Arizona’s best scenic drives, winding past sparkling lakes, stately saguaros and tall canyon walls. Burrowing owls in Gilbert, Arizona – They’re a Hoot! January 13, 2015The burrowing owls at Zanjero Park in Gilbert Arizona are really easy to see, even at high noon, and they’re very cute! Camping World Video Shoot — RVing is for Everyone! April 6, 2018We were thrilled to “star” in a Camping World video as part of their campaign, “RVing is for Everyone.” Here’s the back story. Fall Colors and Wildlife on the Sonoran Desert Rivers in Arizona December 22, 2017Exquisite scenery and easily approached wild animals await RVers in the Sonoran Desert of Arizona along the rivers and waterways. McDowell Sonoran Preserve in Scottsdale AZ November 1, 2014McDowell Sonoran Preserve is a great system of hiking trails in the McDowell mountains with trail heads in Scottsdale, Arizona. Peach Faced Lovebirds in Phoenix, AZ – Parrots in Cactus! March 1, 2016Peach faced lovebirds have established themselves in the wilds of Phoenix Arizona. How cute to see them in the saguaro cactus! Phoenix Parks – Saguaros and Sisters November 27, 2009White Tanks and Bartlett Lake are great parks, but the best was meeting the gals of vintage trailer club “Sisters on the Fly”. Snow in the Arizona Desert – A Beautiful Fairy Dusting! January 13, 2016A fairy dusting of snow in the mountains around the campground at Roosevelt Lake Arizona made for some gorgeous days in our RV. To Catch a Hummingbird (on camera!) January 18, 2014Catching a hummingbird on camera is not so easy, but with a window feeder on our RV and lots of patience, we got great images! The Southwestern quadrant of Arizona is home to Quartzsite, a truck-stop town on I-10 that swells to a million people during the RV show in mid-January. Southwest of there is the city of Yuma, the warmest place in the southwestern US in mid-winter. Quartzsite, AZ – Snowbird Roost December 5, 2007Quartzsite, Arizona is a quirky truck stop town that’s famous among snowbird RVers but is virtually unknown by Arizona residents. Visiting the Dentist in Mexico December 29, 2016Mexican dentists do good quality work at a fraction of American prices, a great option for RVers who travel south for the winter! While Phoenix is Arizona’s commercial hub, Tucson is Arizona’s “cultural” heart. South and east of there elevations begin to rise, and the Chiricahua mountain range is absolutely beautiful and a bit cool, best seen in spring and fall. Dear Deer in Arizona’s Chiricahua Mountains February 11, 2015While strolling in the magical pink and blue light sunset light in Arizona’s Chiricahuas, I had a very special encounter.